“Ovuliparity” occurs when females release or lay unfertilised eggs which are then fertilised in the environment (e.g. many fish). “Oviparity” occurs when a female’s egg(s) is/are fertilised by a male while they are still in her reproductive tract, and are then laid as eggs (e.g. birds). “Viviparity” involves the production of live young from the female. This can be of various kinds and is found in many groups of animals (including humans). It was always thought that dragonflies and damselflies (the Odonata) were oviparous: they lay eggs which sit around in the environment and develop until they hatch into larvae. However, a recent paper has suggested that there could be some cases in which dragonflies come very close to bearing live young. Dayananda and Kitching, writing in a short note in the International Journal of Odonatology, suggest that females of the common blue jewel either give birth to live young or else lay eggs that hatch immediately. This form of reproduction (called “ovo-viviparity”) straddles the boundary between egg-laying and live-birthing. The really wonderful aspect of this is that it is a natural history observation. In the UK we have just been through the Research Excellence Framework assessment which prioritises “high impact” research – if you aren’t curing cancer or solving world hunger then you’re not doing your job right. However, these sorts of apparently minor publications can have a considerable impact on how we view the natural world, and they are likely to grow more common as more and more naturalists carry photographic and video equipment into the field. This particular study is the first example of live birth recorded from either the Odonata (dragonflies and damselflies) or the Ephemeroptera (mayflies, collectively the “Paleoptera” which is one of the oldest groups of winged insects). 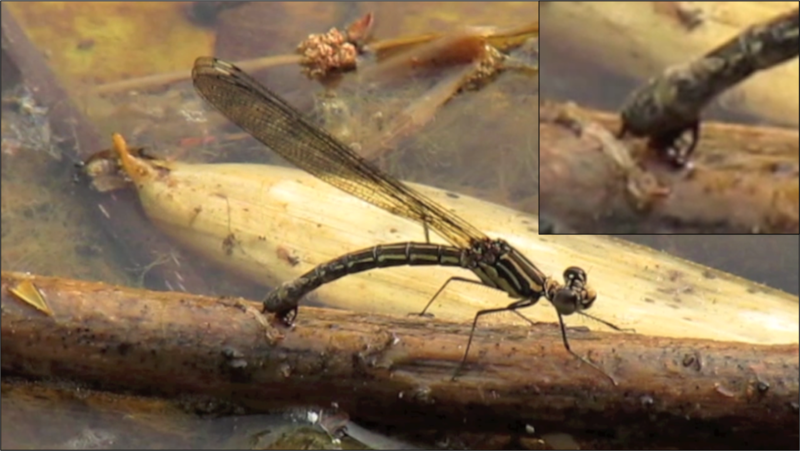 The authors note a few potential explanations, including virgin birth (parthenogenesis, in which case it would be only the second dragonfly species to exhibit this form of reproduction), a “simple” form of viviparity where eggs are simply retained for a time in the reproductive tract, or that this is a behaviour that is only exhibited under certain conditions (“facultative viviparity”). Clearly a lot more work needs to be done to evaluate those hypotheses, but if ovo-viviparity is found to be more common among groups with deep evolutionary origins then this could result in us having to rethink some of our models of reproductive evolution.